It’s time to claim your rightful place as the champion of the Gravitronix arena, but get ready to deal with up to seven other players who are all shooting for the same title! Vanquish your opponents with four different projectiles and the powerful beams of your gravity platform. Intercept attacks and take careful aim at exposed vulnerabilities. Deflect incoming projectiles or capture and charge them with energy for devastating explosive attacks. Team up with a friend and battle through campaign mode or with up to eight players on a single Wii console in versus mode for an all-out battle. Customize your matches with a variety of different options such as flooding the arena with projectiles or making the game insanely fast. 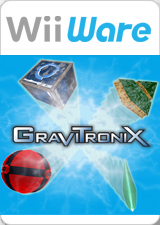 No matter how you like to play, grab your friends and have a blast with Gravitronix! The graph below charts the compatibility with Gravitronix since Dolphin's 2.0 release, listing revisions only where a compatibility change occurred. This page was last edited on 17 January 2018, at 06:43.